It may be famous for having been one of the world's most important steel and iron towns. Yet a new discovery has potentially unearthed a whole new chapter of history in Merthyr Tydfil. Bouncer and local historian Anthony Thomas, 45, has found a series of crop marks believed to date back to Roman times. The find has been hailed as a discovery which could "rewrite" the history of the town. 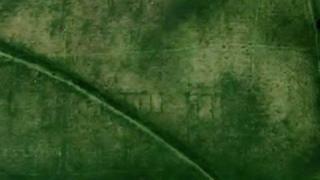 Mr Thomas first noticed the "unusual, rectangular crop marks" after studying aerial photographs of the land. He contacted the Glamorgan-Gwent Archaeological Trust (GGAT) who confirmed that it could be Roman, most likely linked to metal working in the area. The location has not yet been revealed so more exploration can be carried out. Mr Thomas, who first found a silver coin dating back to 78AD two years ago, has since found more coins, pottery, broaches, tiles, beads, cut wood and lead weights. But it is his latest potential find that has attracted the most interest. "In the end, we worked out I've found more than 100 pieces of Roman artefacts from the field," he said. "I always thought, there's got to be a Roman building, so I kept on going. "I started digging holes up there to see what more I could find, and about 3ft (0.9m) down I found the tops of walls which I believe are part of a Roman town. "I'm really excited by it all." Merthyr Tydfil Leisure Trust, working in partnership with Merthyr Tydfil council, GGAT and Cadw, are planning to investigate the site as part of a new community archaeology project. Richard Lewis, GGAT head of projects, said: "What we know about Roman Merthyr Tydfil largely comes from investigations in the late 18th Century, and then in the early and mid-20th Century - little else is known. "In 1786 workers building Penydarren House for the ironmaster Samuel Homfrey found Roman bricks and tessellated pavement (mosaic). "It wasn't until much later, between 1902 and 1904, during the construction of the Athletics Club track that the remains of a Roman granary building finally pointed to there being a Roman fort." Outside the fort, he said little was known about the Roman presence until the recent discoveries made by father-of-three Mr Thomas. "If these crop marks turn out to be Roman then this would be a significant national and internationally important discovery and would rewrite the Roman and industrial history of Merthyr Tydfil," he added. GGAT are now looking to fund the community project and, with the help of volunteers, will carry out two phases of exploration; a geophysical survey followed by a trial trenching during the summer. It is hoped this will confirm whether the site is of Roman origin once and for all. Mr Thomas added: "I always used to joke saying I'm not going to stop until I've found a Roman villa. Now I might have only gone and done it."